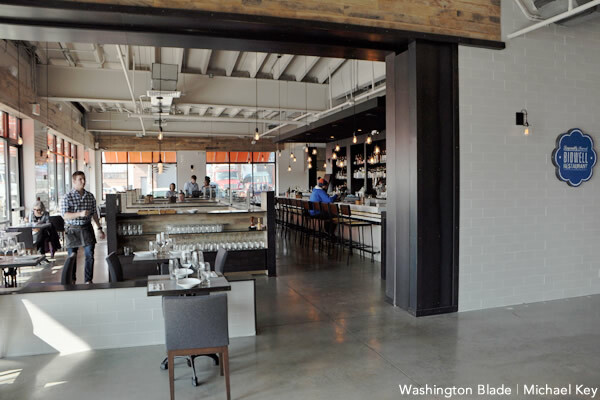 February 19, 2014 at 1:49 pm EDT | by Lou Chibbaro Jr.
A D.C. man has filed a lawsuit and a separate complaint with the D.C. Office of Human Rights accusing a manager at the newly opened restaurant Bidwell of firing him from his job as a waiter because he’s gay. Jacques Chevalier, 22, says in the lawsuit filed Jan. 14 in D.C. Superior Court that manager Scott Wood fired him the day before the restaurant’s grand opening on Jan. 9, telling him he was not a “good fit” for the company. Bidwell is the newest food-related business to open at the Union Market in Northeast D.C. near Gallaudet University. Nationally acclaimed chef John Mooney, who specializes in preparing dishes made from fresh, organic produce, is a principal owner of the restaurant. When approached by the Blade at the restaurant on Tuesday, Wood said he would have no comment on Chevalier’s allegations. Chevalier filed his lawsuit jointly with Cherokee Harris, who charges in the lawsuit that Wood fired her from her job as a server assistant because she’s black. Court records show that Chevalier and Harris are representing themselves without an attorney. Chevalier said he has contacted the gay litigation group Lambda Legal Defense and Education Fund for legal help. He said a Lambda representative told him the group was considering taking his case and would inform him of its decision soon. According to Chevalier, Wood hired him in late December after he responded to a help-wanted ad that the restaurant posted online. He said he never discussed his sexual orientation with Wood and Wood never raised the issue with him. But he said it’s also possible that Wood learned of his sexual orientation in some other way. Although the restaurant didn’t open officially until Jan. 9, Chevalier said the kitchen staff and servers were assigned to work as if it had opened during a trial period of about two weeks prior to the official opening when they waited on guests who ordered food. He said he suspected something was wrong when he wasn’t chosen to attend special events the restaurant held “and when special guests came I was ignored or not introduced,” the said in the lawsuit. “These three men could not have assessed me within that short period of time and determined that ‘I was not a good fit’ other than for the reason of me being gay,” he said. Records filed with the city’s Alcoholic Beverage Regulation Administration show that Bidwell restaurant is owned by Darien DC LLC and its three principal officials are Mooney, Michael O’Sullivan and Michael Laurent, according to ABRA spokesperson Jessie Cornelius. In a Jan. 14 order, Judge Maurice Ross, among other things, called on defendant Wood to respond to the complaint by filing an answer within 20 days of when he was served papers notifying him of the lawsuit. Court records show he was served papers for the case on Feb. 5 and a notice of acknowledgement he was served was filed in court on Feb. 10. The lawsuit seeks $50,000 in damages from Bidwell. Elliot Imse, a spokesperson for the D.C. Human Rights Office, said the office can’t comment on a case until or unless the office determines that probable cause exists that discrimination occurred following an investigation. However, he said that under D.C. law, a lawsuit and a discrimination complaint with the OHR can’t be filed at the same time for the same case. He said the OHR would likely dismiss the case unless the person or persons filing it drops the lawsuit. I think Chevalier’s discrimination claim will be very difficult to prove unless there is some evidence beyond his suspicion that he was fired for being gay. If the owner had stated so in writing, or if other employers heard the owner make anti-gay remarks, that would be strong evidence. But simply suspecting isn’t enough. Lambda Legal may, in fact, be considering taking Chevalier’s case, but that likely means only that Lambda is reviewing his complaint, just as it reviews every complaint it receives. I really am sympathetic, especially as someone’s who’s experienced anti-gay workplace hostility in states where such discrimination is legal, and as someone who’s spent years of my professional life working for LGBT equality. I know managers can be bastards, and people’s rights are often grossly violated where they work, and it wouldn’t surprise me if Chevalier’s claims are true. But so far, I see no evidence. If Chevalier knows of such evidence, I urge him to rigorously document so he can share it with the court. Meanwhile, let’s remember that the restaurant is innocent until proven guilty. If there’s evidence, I’ll be among the first on the picket line. Until then, I look forward to the Blade’s updates on this story. If this is true, it's very sad that this kind of crap is still going on. Thanks for standing up what is right. Often times it is difficult to prove discrimination but I hope they prevail. Sadly upper class gays will stick their head in the ground and eat there anyway. We need to show action and boycott this place. Any updates on this story? Did Lambda accept the case? Is Chevalier still pursuing his claim? Chevalier is taking another route. He will still be pursing the case just not with lambda. What if no discrimination occurred at all and this is a case of inept former employees trying to cash in on a some bs lawsuit? That’s what it sounds like to me. Maybe you need to be sued next..